your carpet or hard wood floors with this puddle shaped shoe organizer. The Puddle Tray is made from durable recyclable plastic that is easy to clean, allows water to evaporate, and is large enough for 5 or 6 pairs of shoes or boots. Finalist in the Bed Bath and Beyond x Kikkerland Design Challenge. The theme for the competition was based around college living. Since I lived in Chicago, Southern California, and Tokyo at different times of my life, I drew upon my experiences to come up with some concepts that I had to present to the Kikkerland design team and president/founder, Jan Van Der Land. 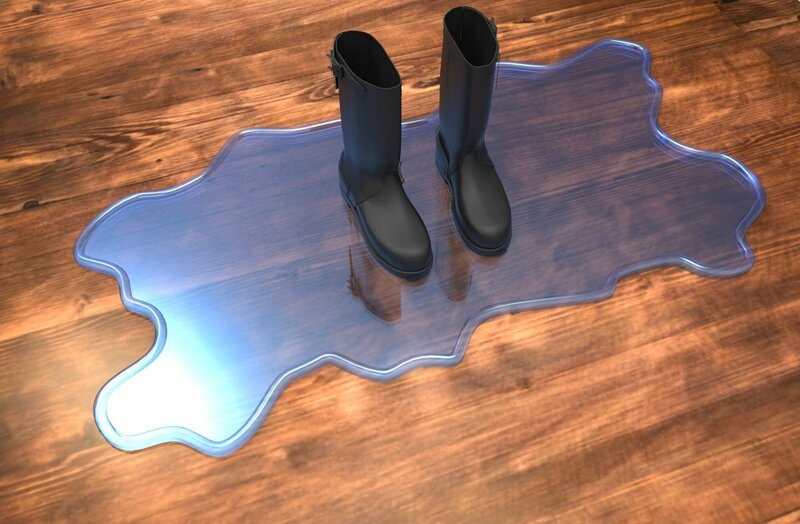 In the end, my puddle shape boot tray was selected as one of the finalists in an online vote. The prototype was created from doing multiple sketch explorations and a process that involved pouring Diet Coke onto pieces of paper and letting them dry to create natural looking puddle shapes. I then 3D modeled a form and cut out MDF shapes. Then I routed over the edge and used a vacuum former to mold a thin sheet of PETG over the form. The puddle tray was shown at Kikkerland's booth at the International Contemporary Furniture Fair (ICFF) in New York City in the Summer of 2015.